!! OMG, how sacrilegious: Church Signs !! If you’ve ever wanted to make a church look ridiculous by mixing up the letters on their sign there’s now a quick, easy, and legal way to do it for free! All you have to do is go to the CHURCH SIGN GENERATOR and it’s easy as 123. 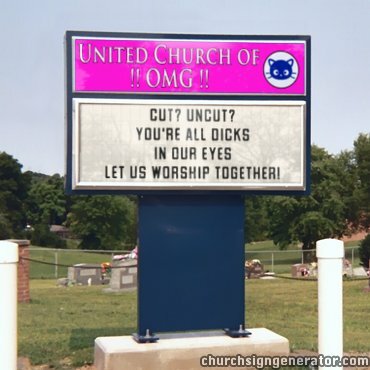 Be the first to comment on "OMG, how sacrilegious: Church Signs"